During a harp care class I gave at Lyon & Healy West in Salt Lake City, one of the attendees, Michele Rasmussen, was kind enough to shoot a few videos of me demonstrating some techniques for replacing harp strings. The videos came out great so I thought I’d post them here and include some additional explanation as well. The first one is shown above. You can find the next one here. For a much more comprehensive demonstration of string replacement, Check out my DVD: Harp Care with Steve Moss. You’ll be restringing like the pros in no time. The technique shown in this video applies to the first, second, and third octaves (and the “zero octave” F and G strings at the top of some harps). For these octaves, it’s important to use some kind of anchor that is thicker than the string you’re using, to insure that the string knot doesn’t pull into the hole and get stuck there. Trust me, you don’t want THAT to happen! My anchor of choice is a one inch (2.5 cm) piece of 5th octave A,B, or C string, the three thickest gut strings on the harp. At Lyon & Healy we were trained that only these three strings were thick enough to provide a stable anchor. I haven’t tested this for myself, but I have seen instances where harps were anchored with thinner strings, and you can see them bend under the string tension. If they’re bending, do you think that string is going to stay in tune? The video shows how I tie the knot around the anchor. I’m using a piece of nylon here. The same technique works for gut strings, but they’re a little trickier to work with because they’re stiffer. Stay tuned for another video in this series where I demonstrate tying 4th and 5th octave string knots. There, I use a gut string and you can see the technique for breaking the integrity of the gut fibers so you can form the necessary loops for your knot. If you don’t want to wait for that blog post, you can watch all three videos now on this web page. In the last two posts, I have discussed some of the differences between nylon and gut harp strings. I strongly recommended that, despite their significantly higher cost, all harpists use gut strings in the fifth through the third octaves. In this range, gut strings provide more dynamic range, a richer, clearer sound, and more accurate intonation. If gut strings are so much better, shouldn’t they be used in every octave? Not necessarily. Let’s consider the first and second octaves in turn. Every new pedal harp I know of comes with nylon strings installed in the first octave, and the vast majority of harpists keep their harps’ first octaves strung in nylon. Why? For one thing, gut strings in this register are pretty fragile and subject to breakage. For another, the qualitative difference in sound that I have discussed between gut and nylon strings is far less pronounced in this range. I have mentioned before that nylon strings have a more complex, or layered sound, with greater emphasis on partial pitches, or overtones. In the first octave, though, many of these overtones are so high the human ear doesn’t hear them, so the string’s fundamental pitch is more prominent by default. Those overtones that our ear does perceive tend to give first octave nylon strings a brighter sound than gut strings, and this makes them more distinct and easier to hear, especially in ensemble situations. So, while you might wish to experiment with gut strings in your first octave, I generally recommend nylon strings. 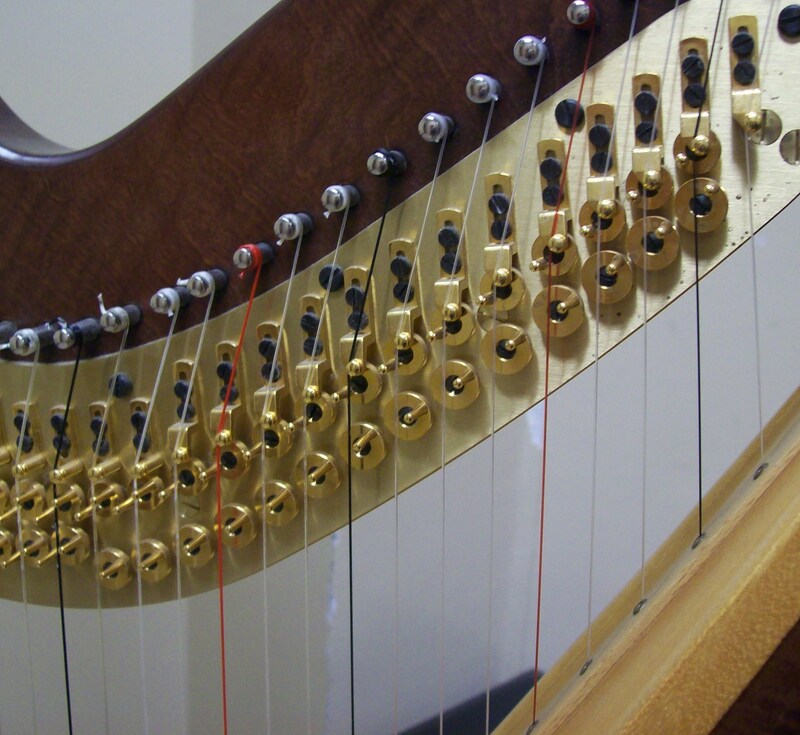 New pedal harps are delivered with gut strings in the second octave, but you will run into quite a few harpists who have replaced these with nylon strings. For many people, this is an economic decision, and this makes sense. In the second octave, nylon strings give a strong, reasonably clean sound, with acceptable intonation. They are certainly worth a try. If they sound just as good to your ear as gut strings, then by all means use them, as you’ll save some money. Some harpists, though, are sticklers for intonation, and if you are one of them I’d encourage you to use gut strings in the second octave. Gut strings can be regulated more accurately than nylon strings. Since they flex less, their intonation will vary less as your dynamics change, while a nylon string played fortissimo will then to sound flatter than the same string played mezzo piano. If you are a newer or casual player with a soft touch, you will demand less from your harp, and nylon strings may serve you just fine. I have talked to a number of symphony harpists who prefer nylon strings in the second octave because their brighter quality helps them “cut through” the other instruments in the orchestra, and in this context the harp needs all the help it can get. If you play in a lot of orchestral or other group situations, you may want to try nylon strings in your second octave to see if they give your sound an extra boost. To sum up, then, I encourage most harpists to use gut strings in the third, fourth, and fifth octaves, and nylon strings in the first octave (and “zero” octave). Your choice in the second octave depends on your preference and your situation, so I would encourage you to experiment with both.